Scouting in Northern Ireland is represented by three Scouting associations. The Scout Association of Northern Ireland is part of the Scout Association of the United Kingdom, which is the World Organization of the Scout Movement (WOSM) recognized Scouting association in the United Kingdom. Scouting Ireland is the national Scouting association and the WOSM-recognized Scouting association for the Republic of Ireland, although its membership extends to Northern Ireland. The Baden-Powell Scouts' Association of Ireland is a member of the World Federation of Independent Scouts and operates one group in Northern Ireland. The Scout Association has seven Scout Counties covering the 6 counties that make up Northern Ireland plus the City of Belfast. The Scout Association, Northern Ireland is an observer member of the Federation of Irish Scout Associations (FISA). Scouting Ireland is part of Northern Scout Province and has five Scout Counties. Its Northern Province Commissioner is Wendy Marrow. During the Troubles the number entering the Catholic Boy Scouts of Ireland skyrocketed as parents were eager for their sons to participate in Scouting rather than join the Provisional IRA like many young men of the time. The Scout Association of Northern Ireland and Scouting Ireland are running a Scout Citizenship project to improve the relationship between the two Scouting associations in Ireland. 120 Northern Ireland Scouts, along with 12 leaders, took part in the 21st World Scout Jamboree to celebrate the 100th anniversary of Scouting at Hylands Park near Chelmsford, Essex in 2007. 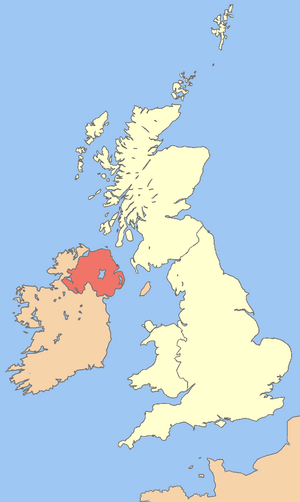 The Scout Association County of County Antrim covers the County of Antrim in Northern Ireland. The County Commissioner is John Logan. The four Scout Districts are Antrim and District, Lisburn and District, Mid Antrim, South East Antrim. The Scout Association County of County Armagh covers the County of Armagh in Northern Ireland. The three Scout Districts are Lurgan and District, Armagh and District, and Portadown. The Scout Association County of City of Belfast covers the City of Belfast. The County Commissioner is Derek Wheeler. The five Scout Districts are East Belfast, North Belfast, South Belfast, South East Belfast and West Belfast. The Scout Association County of County Down covers the County of Down in Northern Ireland. The County Commissioner is Stephen Donaldon. The four Scout Districts are Ballynahinch and Downpatrick, Banbridge and District, Newry and District, Newtownards, and North Down. The Scout Association County of County Fermanagh covers the County of Fermanagh in Northern Ireland. The County has no Districts and has just eight Scout Groups. The Scout Association County of County Londonderry covers the city of Derry and the surrounding county of Londonderry in Northern Ireland. The three Scout Districts are Coleraine, Londonderry and Mid Ulster. The Scout Association County of County Tyrone covers the County of Tyrone in Northern Ireland. The County Commissioner is David Skuice. The four Scout Districts are Clogher Valley, Dungannon, Omagh, and Strabane. The 1st Strabane Scout troop is the longest continuously operating scout troop in Northern Ireland. Brian Boru Scout County covers parts of County Armagh and County Tyrone with a total of 9 Groups. Down & Connor Scout County covers County Antrim, County Down and Belfast with a total of 15 Groups. The 2006 Phoenix National Patrol Challenge was held at Tollymore Forest Park Co. Down. Erne Scout County covers County Fermanagh with a total of 7 Groups. Covers part of Counties Tyrone, Londonderry and Donegal with a total of 17 Groups. Covers part of counties Tyrone, Londonderry and Antrim with a total of 9 Groups. Crawfordsburn is the Northern Ireland Scout Centre, 12 miles from Belfast. The Fermanagh Scout Council runs Cladagh Glen Scout Centre. The 1st Newcastle Scout Group from Newcastle, Co. Down runs Tipperary Wood Campsite. Castle Saunderson is being developed as a cross-border Scout campsite. While it is in the Republic of Ireland, the estate has an entrance in both Northern Ireland and the Republic of Ireland. For details of sections in the Scout Association see Scout Association Sections. For details of sections in the Scouting Ireland see Scouting Ireland Sections. For details of sections in the Baden-Powell Scouts' Association of Ireland see Baden-Powell Scouts' Association. Beaver Scouts started in the Scout Association in Northern Ireland in 1965. Scouts Ireland started the section with considerable help from the Scout Association in 1979. ↑ "WOSM Circular Nº 9/2004" (PDF). World Organization of the Scout Movement. May 2004. http://scout.org/en/content/download/7704/69415/file/C0409wsc_e.pdf. Retrieved 2009-01-22. ↑ "Si Northern Province". SI troops in Northern Ireland. Scouting Ireland. http://www.scouts.ie/provinces/northern-scout-province/. Retrieved 2006-07-19. ↑ "Phoenix Information Pack". Scouting Ireland Events Team. http://www.scouts.ie/filestore/documents/events_documents/phoenix/The_Phoenix_Challenge_Information_Pack.pdf. Retrieved 2006-07-19. This page was last edited on 6 May 2012, at 13:10.